So on Friday past I attended my 1st ever Mercedes-Benz Bokeh South Africa International Fashion Film Festival. The festival is one of the most creative and inspiring Fashion Film Festivals globally. The festival brings together creative’s in the Film, Fashion, Artistic and related technical industries to celebrate their craft twice a year. South Africa International Fashion Film Festival held at the stylish 15 on Orange Hotel in the Cape Town CBD. The 2 day fashion and film extravaganza, founded and owned by film-maker Adrian Lazarus provided a focused platform for both local and international up and coming talent to showcase their fashion films and design in conjunction with pop-up retail outlets and focused industry talks. The event attracted the very best in South African fashion talent with greats such as Hendrik Vermeulen, Adriaan Kuiters and Jenevieve Lyons to name a few and each design house showcasing unique collections while some also featured fashion forward installations. channel Fashion One TV, electronics manufacturing giant Hisense, RGBC, African Pride 15 on Orange and Protea Hotels Fire and Ice, Sunglasses Hut, Platinum Groups labels Jenni Button by Warrick Gautier and their men’s label Hilton Weiner. Each day-event culminated with a high glamour ‘Oscar-style’ Red Carpet evening, with invited guests inspired to dress for the occasion and clearly showing that there is overwhelming support for high fashion and the fashion and film industry in Cape Town. I arrived at the event and was very pleased to see a familiar face, the lovely Bailey Schneider which calmly introduced to me to the very much daunting red carpet walk.Everyone was dressed in beautiful designs and gowns it really was a must see. Natalie Becker was the charming MC on the evening, introducing each film as well as the respective producers. All the films submitted for the festival were assessed by a panel of esteemed local and international judges, with 52 finalists nominated across various categories with their films showcased over the two nights of screenings during the festival. So I was invited by the lovely ladies from Girls about Town to celebrate Bronx Woman's 10th birthday and the launch of the A/W15 collection! I arrived at the event and were treated to a welcoming drink, yummy macaroons & seductive treats. Even better than that were an beautiful aerial display of Bronx Winter 15 collection footwear. As we entered we also had to select a number at the entrance which you then would be able to open an envelope which was mounted against the wall. Awesome prizes was ready to be won. My number got me some awesome Rimmel Products... Total Win! My friend from the blog called BeFabBeYou accompanied me. It’s always so much fun attending events with her as she’s such a darling. An exquisite shoe and light installation hung suspended from the ceiling behind a large gold frame where guests posed for selfies galore. 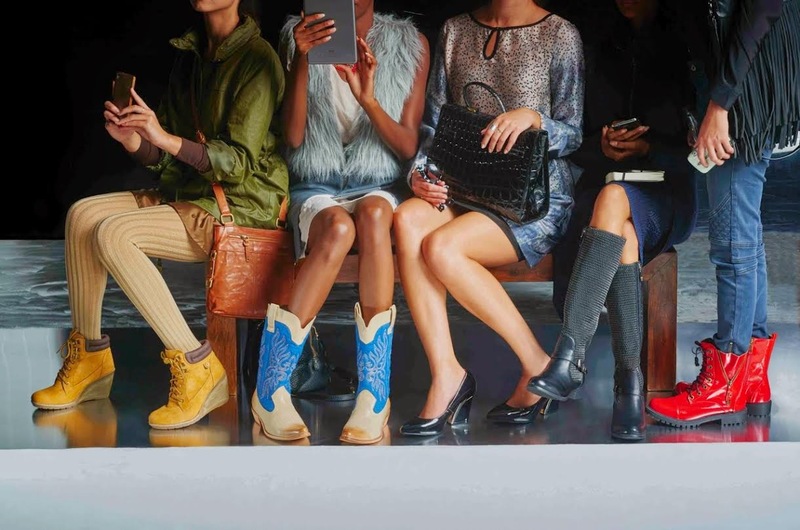 The beautiful new AW15 FRow collection was also unveiled, inspired by the bustling front row of international fashion weeks where the industries top fashion editors, influencers and stylists set the trends. So to top off this awesome event Bronx Woman has given me the opportunity to give away 1 Pair of stunning boots from their W’15 collection and my absolute favourite is this black ankle boot called Tiana. All you need to do to stand a chance is tweet, share like this picture below on as many social media platforms as possible. The more you interact with me, the greater your chances. Hi Everyone! So last week I was given the awesome opportunity by Ford South Africa to test drive a Ford Ecosport 1.0 Titanium for a whole entire week. Yup so when it arrived last week Wednesday at about 11:30am at work & I was so excited that I could hardly wait to till 4pm to knock off from work to take it for a spin. We then spent the afternoon in Jacobsbaai and even managed to take some dirt & dusty roads with ease. This Ford Ecosport makes being on social media and chatting to my friends such a breeze, I always seem to run out of battery life on my phone and then have to wait till I get home to recharge, but this SUV has its own build in USB port which I was able to easily charge my phone as I drive. I could even pump up the sound with Ford Audio / CD / MP3 with 6 speakers. Ok! So now you’re asking me what does this SUV not have? Uhmmm I think they have pretty much thought of everything. I’m talking of electronic air temperature control, rain sensing wipers, fuel/trip computer & Ford SYNC® with bluetooth and voice control. For more information, check out their link by clicking here. On Wednesday, 18th of March, Gert-Johan Coetzee has showcased his latest Spring/Summer 2015 collection. They have now opened up an “Shop the Ramp” campaign which allowed those who are not attending the show to still be a part of the action. But now I want you to get involved. I have attached garments that were all part of the Gert-Johan Coetzee collection and are now available at Spree. Win a R250 Spree voucher which you can use towards purchasing your favourite item. All I need you to do is tell me which garment you like best and why? Sharing, re-tweeting and reposting the item you love on the various social media platforms, will give you a greater chance of winning! So can I just say that reviewing this Dear Deer Satin Pillow slips has been something that both my husband and I enjoyed. Which is rare as his not quiet keen on testing and reviewing lipstick shade and nail polishes. So I love the fact that I could even get his take on it. Let me jump right in and tell you all how awesome these satin pillow slips are, if you think this is an ordinary pillow slip you are sadly mistaken. Ok so since I've heard that, I've been hooked! Recommended use: 8hrs daily for best results. So you’re looking for your Dear Deer satin pillow slip fix. It really is such an Amazing product and a really awesome gift idea. “Mom now you know what you’ll be getting for your birthday:) ” These stunning satin pillow slips comes in array of different colours from White, Champagne, Black & Baby Pink and they are R140 a slip & check the below website to get your stash!